To sign up for a free seven-day trial of ESPN+ click here. Marlon Moraes and Renato Carneiro want to fight for the UFC title. To do that, they’ll first need to dispose of two longtime veterans in the form of Raphael Assuncao and Jose Aldo, in what is an all-Brazilian affair atop the UFC on ESPN+ 2 mixed martial arts (MMA) fight card this Sat. night (Feb. 2, 2019) inside Northeast Olympic Training Center in Fortaleza, Brazil. Moraes and Assuncao are no strangers, having fought to a split-decision at UFC 212 in June of 2017. It was the Octagon debut for “Magic,” who was forced to settle for a split-decision loss. As for Aldo, this will be his opportunity to prove he’s still got some gas left in the tank. Well, at least enough to last three rounds. Before we take a closer look at the UFC Fortaleza main and co-main events, let’s see what pro fighter and MMAmania.com fight analyst Andrew Richardson had to say about the rest of the ESPN+ main card by clicking here. Odds and betting lines for all of this weekend’s action can be located here. I’m always fascinated at how Raphael Assuncao can make any fight boring, which sounds like a biting critique, but it’s actually kind of an amazing attribute and a testament to his complex game. The Brazilian has a way of shutting down explosive fighters and making dynamic strikers like Marlon Moraes look … well, ordinary. That’s what happened in their first go-round and I would not expect much of a difference in their bantamweight rematch. Part of what makes Assuncao so difficult to open up against is his counterattack, as well as his formidable grappling. He’s not perfect, of course, but 7-1 over the last eight years is pretty damn close and his patient, defensive-minded style is well suited for five rounds. I think the big question for me, is how healthy he is at age 36 in a career that saw its fair share of debilitating injuries. Like his opponent, Moraes has been a tough nut to crack at 135 pounds. Jimmie Rivera learned — after waking up — that trying to stand and bang with “Magic” will make your consciousness disappear. That performance, along with his blistering knockout over Aljamain Sterling, is exactly what Moraes needed after the first Assuncao fight, which he followed up with a ho-hum win over flyweight export John Dodson. That tells me he’s settled in and comfortable in his new home. Hopefully not too comfortable. 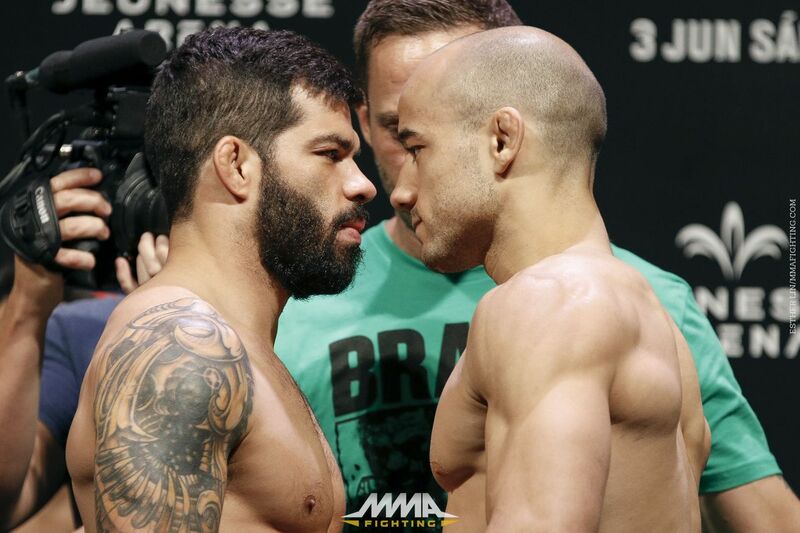 I think Assuncao is a bad match up for Moraes, much like he was the first time they fought. That said, “Magic” is firing on all cylinders and is competing in his athletic prime. Assuncao turns 37 in July and speed — as well as timing — are the first to go. Look for something clean to land, and land early, making Moraes the clearcut contender at 135 pounds. It’s weird to hear people talk about Jose Aldo like he’s some old, washed-up relic from the days of World Extreme Cagefighting (WEC). The Brazilian is still just 32 years old and his only losses in the last 14 years have come against Conor McGregor and Max Holloway, two of the best strikers in the world, in any weight class. I think it’s the manner in which he lost that has everyone jumping ship, but his finish over Jeremy Stephens tells me that Aldo isn’t done just yet. He’s still a dangerous striker with blistering speed and a resume that boasts the best fighters to ever compete at 145 pounds. Where Aldo runs into trouble is his cardio. When opponents allow him to operate at a measured, defensive pace, “Junior” shines through a combination of precision striking and punishing leg kicks. Unfortunately, as we saw against Holloway and even as far back as Mark Hominick, his meaty frame will often betray him in high-output fights. Limbs become heavy, breathing becomes labored, and the Brazilian is essentially a sitting duck. Sorry, I don’t believe that crap about title shots when it comes to choosing a three-round fight. Carneiro, 29, is touted as one of the premiere grapplers of the featherweight division and for good reason. Not only is he adept at out-thinking his opponents, that long, lean frame bodes well for wrapping up limbs during a ground scramble, much like Charles Oliveira. That said, he doesn’t get enough credit for his striking, which may be because he doesn’t have any wins by knockout in 15 trips to the cage. Cardio has never been an issue and I don’t expect this fight to be the exception. It’s no secret that MMA is a cruel mistress and when she’s done with you, she’s DONE. Has Aldo been door slammed? Maybe, but I think this is the fight that makes (or breaks) that case. Carneiro has been impressive to date, but his level of competition has been “good” and never great. Submitting Cub Swanson is something that has been done seven times and “winning the Brian Ortega fight until…” is a poor argument. You’re only winning a fight when it’s over and your hand is raised and “Moicano’s” wasn’t. Without a victory over a Top 5 opponent, I can’t see a reason to pick him over someone as decorated as Aldo. MMAmania.com will deliver LIVE round-by-round, blow-by-blow coverage of the entire UFC Fight Night 144 fight card on fight night (click here), starting with the ESPN+ “Prelims” undercard bouts at 5 p.m. ET, followed by the ESPN+ main card start time at 8 p.m. ET. For the complete UFC Fortaleza fight card and ESPN+ line up click here. The Ultimate Fighting Championship will be voyaging to a nation that has not yet held a UFC event in its borders, giving the fans something they want with a hometown top contender facing off against a longtime UFC mainstay in the headliner. Sometimes, things just don’t come out right, and that’s okay. Artist Adam Nelson decided to have some fun with this poster he made, but ultimately wasn’t happy with. 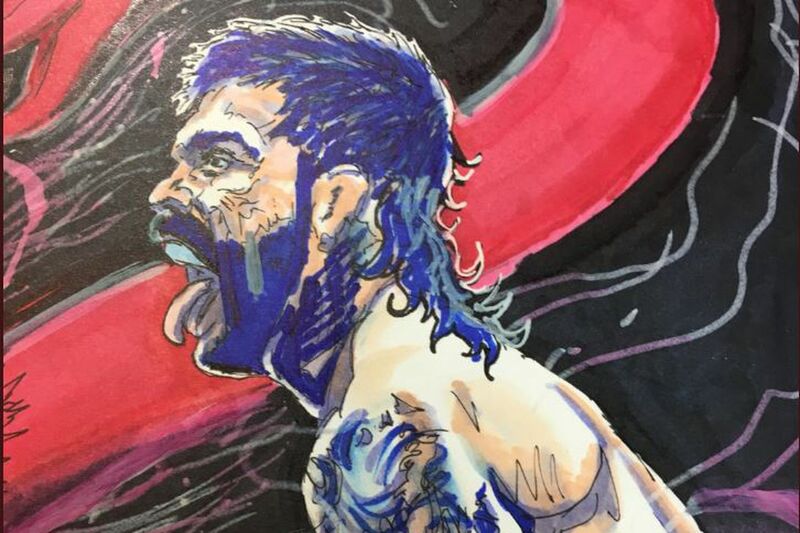 He decided to draw the UFC champions and contenders… with mullets. I’ll be honest… Henry Cejudo looks amazing. The former Olympian should think about adopting this mustache and hair for his permanent look. Demetrious Johnson just looks strange with a mullet. He’s such a clean-cut, professional fighter, both in his near-flawless technique and in his interviews, that a mullet just seems out of place on him. I can see the TJ Dillshaw mullet… but why does the KO’ed version of Cody Garbrandt wear these sunglasses?? Cody Garbrandt, who actually takes meticulous care of his hair and beard at all times, looks the most true to life of any of these fighters, which is frightening. Maybe it’s the Ohio roots- if it’s anything like rural Pennsylvania or western New York or where I grew up, there are surely more than a few Ohio natives who still rock a mullet. Sometimes mistakes can be a good thing in the end. Cody Garbrandt and Henry Cejudo both attempt to make their own lemonade out of lemons in their rematches this weekend, each fighter professing to have learned from their mistakes against Dillashaw and Johnson, respectively. Their tasks, presumably, won’t be as easy as painting mullets on canvas. They must paint violence in the Octagon better than their opponents, or wind up in no man’s land in their divisions. Belal Muhammad says that fighters lie about their weight cuts… could that be worrying for Henry Cejudo? It’s great that Colby got to use his belt that Dana is planning on stripping soon. Kamurashops drew Nick Diaz in there, just for fun. Vinny Maghales scored this grazing headkick knockout at PFL 5 tonight! What a remarkable beginning and ending to a fight by Chris Wade! Remember when Demetrious Johnson effortlessly destroyed Henry Cejudo? Old, but remarkable KO by Ricardo Ramos over Justin Rader. He knocks Rader down moving backwards on one foot. The combatants in Saturday’s heavyweight superfight at UFC 226 were also the event’s top earners. “The Ultimate Fighter 27” Finale is taking place Friday, July 6 at T-Mobile Arena in Las Vegas and will be headlined by Brad Tavares taking on undefeated Israel Adesanya. Jockeying for position on the Ultimate Fighting Championship featherweight ladder, it was only natural for Cub Swanson and Brian Ortega to someday meet. LOS ANGELES — Dominick Cruz was taken aback when he first heard that the California State Athletic Commission (CSAC) was enacting new weight-cutting rules. The main catalyst was that Cruz heard that CSAC didn’t want fighters to dehydrate at all to make weight. Cruz defends his title against Urijah Faber in the co-main event of UFC 199 on June 4 at The Forum in Inglewood, Calif. Rockhold, the middleweight champion, will face Weidman in a title fight that headlines that card. It’ll be the first UFC event in California since CSAC passed its new regulations in February. While CSAC would prefer fighters did not dehydrate at all before hitting the scale, the process is inevitable. CSAC is taking measures to prevent severe dehydration with an eye toward fighter safety. The commission will now be doing specific gravity tests to determine if fighters are properly hydrated on fight day. On the day of weigh-ins, fighters will be examined by doctors to see if they are severely dehydrated. If a fighter fails a specific gravity test, or a physician determines they are severely dehydrated, the fighter will be pulled from the bout. One of the biggest changes will be the weigh-in procedure. Fighters will have the option of weighing in earlier, as early as 10 a.m. the day before the event. The idea is that it gives athletes more time to rehydrate. If they chose to, athletes will be able to go to a room in the host hotel in the morning, weigh-in before commission officials and then they’re done. No more waiting around until the weigh-in show in the afternoon. The UFC’s weigh-in show will be more of a spectacle than the official procedure. Fighters will likely still come out and square off as always, but it won’t be the real weigh-in from a regulatory perspective. If a fighter doesn’t wish to hit the scale early, he or she can still weigh-in at the normal time of 4 or 5 p.m. as part of the UFC’s weigh-in show. While the four UFC 199 headline fighters are wary and uncertain about dehydration and specific gravity testing and what it will mean for them, the ability to weigh-in earlier was met with unanimous approval. The Kansas Athletic Commission has already enacted the earlier weigh-in and used it for Bellator 150 in February. Mohegan Sun in Connecticut will try the same thing for Bellator 153 next month. CSAC has also banned IVs for rehydration purposes, which was already instituted by the UFC when it partnered with USADA on an anti-doping program last year. UFC vice president of health and performance Jeff Novitzky told MMA Fighting in a recent interview that the promotion is in favor of CSAC’s actions. He said that he has already seen fighters cutting less weight after the implementation of the IV ban. The top fighters from UFC 199 have not been fully informed of what the new rules will entail yet. None of the four knew about the ability to weigh-in earlier and were unclear about the details as a whole. Faber said his MMA Inc. management team is looking into it. He is concerned, because he cuts from 163 pounds to reach the 135-pound bantamweight limit. A former college wrestler, Faber said knows how to game the specific gravity tests. None of the UFC 199 fighters interviewed Wednesday thought weight cutting was a real problem in MMA. Studies have shown, though, that extreme weight cutting can lead to athletes being more susceptible to knockouts, concussions and traumatic brain injury because there’s not enough time to rehydrate the fluid on the brain. Plus, there are also other long-term hazards, especially with regards to kidney functions. Many of the UFC’s elite fighters have nutritionists and treat cutting weight like a science. Weidman said it was miserable cutting 32 pounds in 10 days to fight Demian Maia on short notice in 2012, but otherwise he doesn’t feel like it’s a big deal. “I’m fighting twice a year and I really try to do it the right way,” Weidman said. “It’s not like I’m cutting weight every weekend like a wrestling tournament. I think your body can handle it. The Ultimate Fighting Championship has taken a liking to exporting Ronda Rousey’s box-office horsepower to far-off places. Daniel Cormier will try the bull’s eye on for size.